Home » Frugal Living » Health and Beauty » Should You Ever Buy Eyeglasses Online? Have you considered buying your next pair of glasses online? In most cases, you can save a ton of money this way. In fact, you'll often spend up to 10 times more for the same pair of glasses by purchasing them at your local optician's office. Shopping online for your next pair of glasses is very convenient and will allow you to compare various prices and frame options to find the very best pair. Most places also offer free shipping. Here's how to get started. In order to find the perfect pair of glasses online you'll need to collect some details about your eyes and your prescription first. If you can still see fine with your current glasses, then call your optician for your current eyeglass prescription. If your vision has changed, then you will need to schedule a new eye exam. You'll need your OD (oculus dexter), OS (oculus sinister), and the SPH (spherical correction). Typically, your optician will provide you with your pupillary distance (PD) measurements following your eye exam. If you do not have this information, you'll need to measure the space between your pupils using a mirror and a ruler. You can reference this PD measuring infographic for assistance or use your computer's webcam to take a photo for Warby Parker's PD measurement service. There are several add-ons that you should consider, such as what lens material and coating you'll need. Some of the most common lens types are polycarbonate, high-index, and regular plastic. You can get ultraviolet (UV), anti-scratch, and anti-reflective coatings, as well as tinted lenses. With most online eyeglass services, you can have several sample frames sent to your home to try on for a few days. Warby Parker, for example, will send you up to to five frames for a week, so you have time to see how you feel about them. Other services (like Glasses.com) will also allow you to try on glasses virtually, using one of your own photos — or you can try the glasses on a model of your choosing. This can save you even more time and help you choose the perfect glasses for your face and personal style. Most online retailers offer some sort of return or refund policy if you aren't happy with the glasses. In fact, many stores (such as 39DollarGlasses.com) offer a no-hassle return policy and a satisfaction guarantee, so you can rest assured that you will be happy with your purchase. You most likely won't get the same option at your optician's office. 4. Which Services Are Best? While Warby Parker seems to be the highest rated service online, some stores offer an unbeatable selection — Like FramesDirect with nearly 35,000 frames to choose from. There is no one standout service, so your best bet is to compare the various product and price options at several different retailers. Some services charge different prices based on the frames you choose, starting as low as $6.95 — while other services (like Warby Parker) offer set rates, like $95 total for each complete set of eyeglasses. Others (like GlassesUSA) will offer a best price guarantee, so you can feel confident you are getting the best deal. However, it never hurts to compare the prices at several top competitors. Your vision insurance will most likely only cover frames that you pick in-store. If you have vision insurance, you will need to find out what exactly your benefits cover. On the other hand, some online retailers (like EyeBuyDirect) now accept Flexible Spending Account dollars, so you can put your FSA debit cards to use. Most online eyeglass retailers make the process as easy as possible for their buyers. However, if you don't know which measurements or coatings are right for your glasses, you may want to have an optician help you. In this case, it may be easier for you to just purchase glasses in the store. Getting your glasses at a local shop may also ensure the best possible fit. If your new glasses don't feel right, your shop can adjust them for free, or for a low fee. You won't get these same types of adjustments with online retailers. 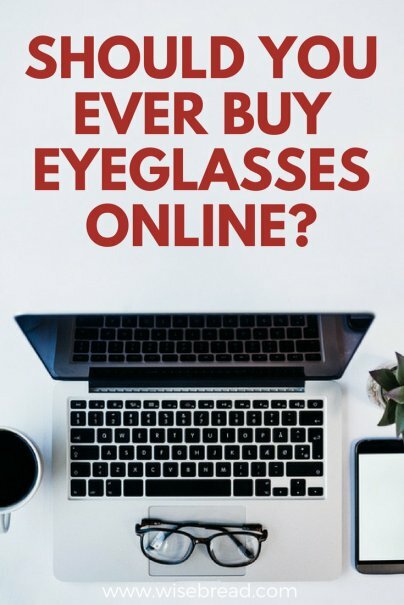 Have you purchased eyeglasses online? What was your experience like? Please share your thoughts in the comments! Over the past 15 years I purchased two from your list and got the big savings. One of these was the sub $10 pair I keep as backup-- I would say this frame seems rather small and thin, maybe better suited for a child, and I had to pay shipping on this one. Still, I think both pairs are well worth what I paid. Frankly, given the yawning price disparity, I don't see how optical shops stay in business. Myself and several people I know by from Zenni Optical and I love them. They offer a large variety, inexpensive and easy to order from. I recently made a purchase from www.GlassifyMe.com and was quite pleased with everything. The best part was that I got the glasses surprisingly quick, I believe within like 3 days. Disclaimer: I know someone who works there. If you are shopping for special corrections like astigmatism, you may not be able to shop online. Do not think online shopping for glasses is very good choice if you are overweight. Will end up with bowing frames that pinch sides of your face. You need to try on frames at store to get good idea of fit if you are overweight. Easier to shop your local eye Dr optical shops for cheapest deals. Sadly the retail stores like Walmart, Sears and JcPenneys often have too much small print on special offers to really get a good deal. I have bought from Zenni several times. My most recent order was for prescription glasses with transitions lenses that get darker in sunlight. They only cost me 20 bucks! Well worth it! It's a great option if you want some fun patterns or funky shapes to wear on occasion because you aren't paying very much for them. It's important to figure out what size you need though. A few years ago I bought two pairs (~$10 each) and one of them was wayyyy too big for my face.